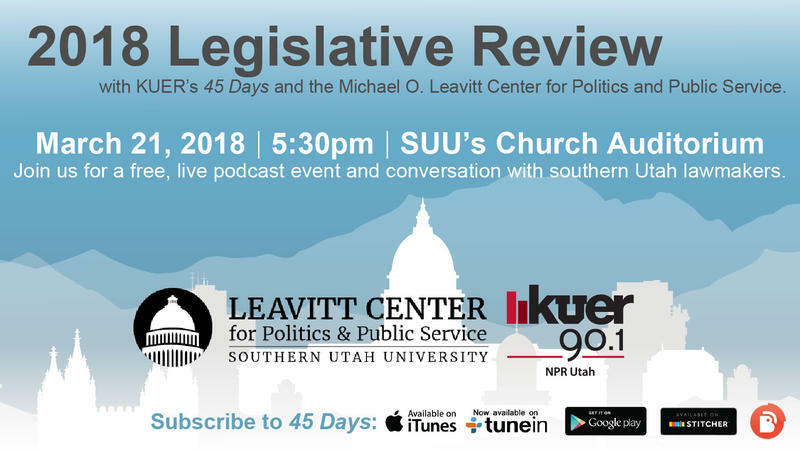 2018 Legislative Review with KUER's 45 Days and the Michael O. Leavitt Center for Politics and Public Service. Learn about the bills that survived, died and followed the path of the latest rap song at the 2018 Legislative Review, with KUER's 45 Days and the Michael O. Leavitt Center for Politics and Public Service. Join the audience as 45 Days podcast hosts Julia Ritchey and Nicole Nixon wrap up the 2018 Utah Legislative Session for a live taping of their final episode. Ritchey and Nixon will give a recap of the 45-day session, quiz the audience on your Capitol Hill knowledge and speak with local lawmakers. The Church Auditorium is located inside Southern Utah University's Sharwan Smith Student Center at 351 W University Blvd, Cedar City, UT 84720. Click here for a map of SUU's campus.